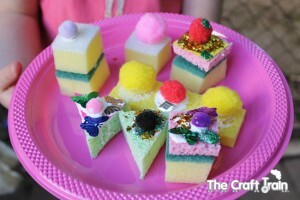 Last week, in honour of our 1st Bloggiversary, we decided to make some sponge cakes for a pretend tea party. 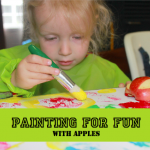 I must say that as far as my own kids go this has been one of the most popular crafts we’ve ever done. Miss R’s little friend, Miss B, came over to play and they all made a platter of cakes each. 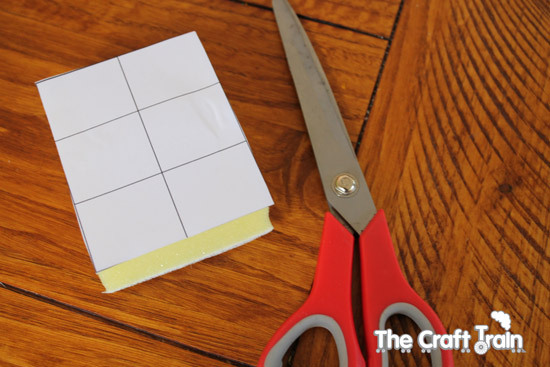 Print out a copy of my squares and triangles template. I originally had circles as well as you can see in the picture but decided they were too time consuming and difficult to cut out, so stick to the squares and triangles for much easier cutting. 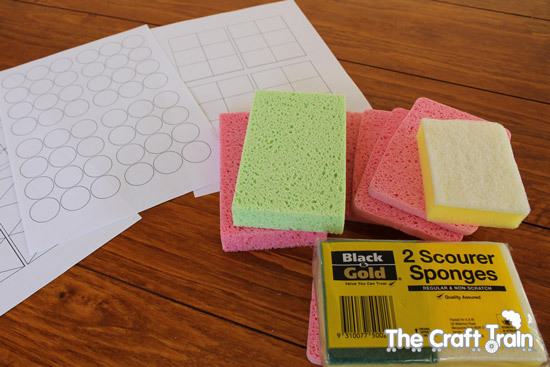 Hold the template over the sponge, and cut out with a sharp pair of scissors into little shapes. Repeat with the felt. I cut some of the left over sponge scraps into long “fingers” for making finger buns. 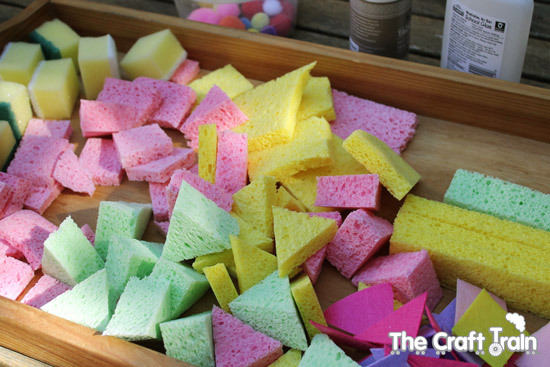 The girls had a go at cutting out the shapes too, and enjoyed the sensory experience of cutting the sponge with scissors. Their shapes are a bit higgledy-piggledy and all different sizes but they thought they looked fantastic and we used them all anyway. 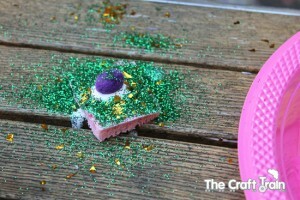 If you are using loose glitter like we did I recommend taking this activity outside – they will make a huge mess. Let the kids stick all the pieces together and decorate however they like, my kids and their friend had great fun doing this. We used tacky glue because regular pva would not be strong enough to hold the pom poms onto the felt for long. 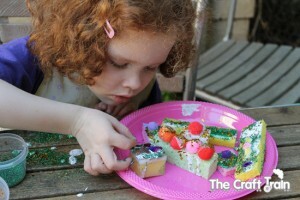 The girls were VERY generous with the glue and used plenty of it for every cake. We only had a small bottle of the tacky glue and they used the whole lot in one sitting. 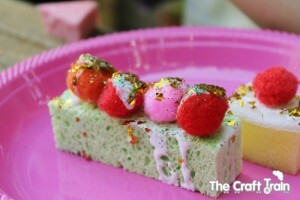 Miss R’s delicious looking green sprinkle cake. The cake-decorating artist at work. We decided the cakes from all three girls were so gorgeous that they could definitely be cake decorators when they grow up. The cakes dried well after only a few hours (amazing considering the amount of glue used, but boy was it a hot day!). 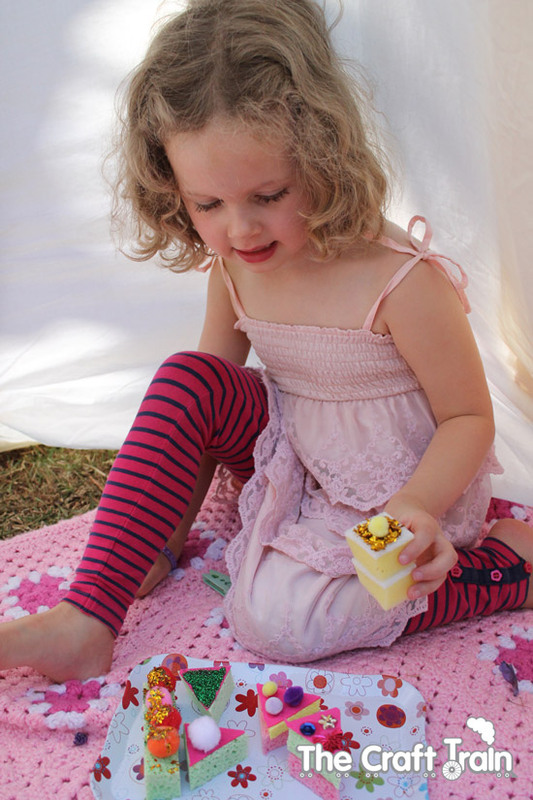 The toys have been very spoiled with lots of lovely cakes and tea parties! I’d like to know does your child enjoy arts and crafts? 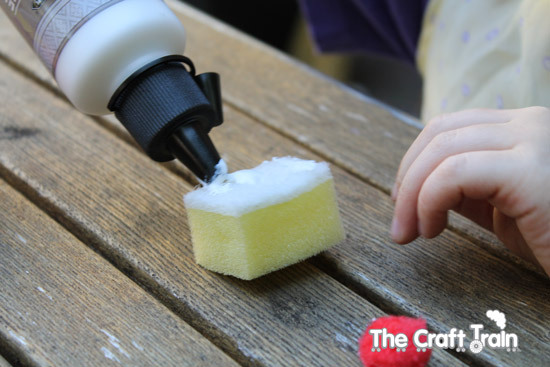 Can you remember if you enjoyed arts and crafts as a child? 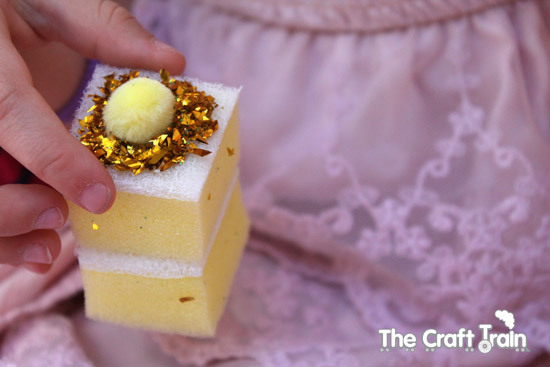 Kate is a mother of two and blogger at The Craft Train. 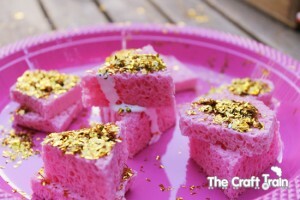 She aims to keep her craft ideas simple, achievable, inexpensive and creative – oh, and fun too. Hope you like them! Congratulations on writing for Easy Peasy Kids Kate, and what a great craft to start off with! 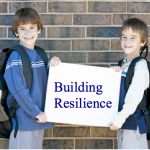 What a glorious craft for kids to be involved with and then able to play with their efforts and creations. 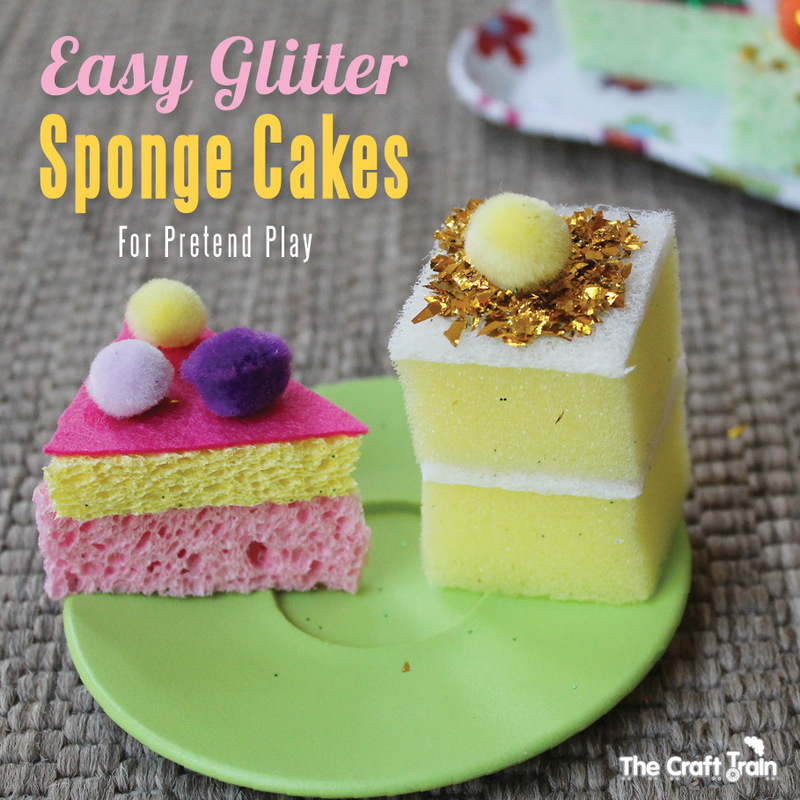 Love the glitter sprinkles…we are going to have to try some of these, already have the sponges just waiting! 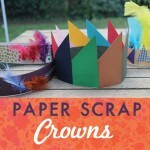 Now this is simple crafty awesomeness I can do! They looks so real! But they are so simple!! Awesome! Oh I love these! Such a clever idea!